a 3200 sq foot lakefront comfortable family home with all of the amenities. 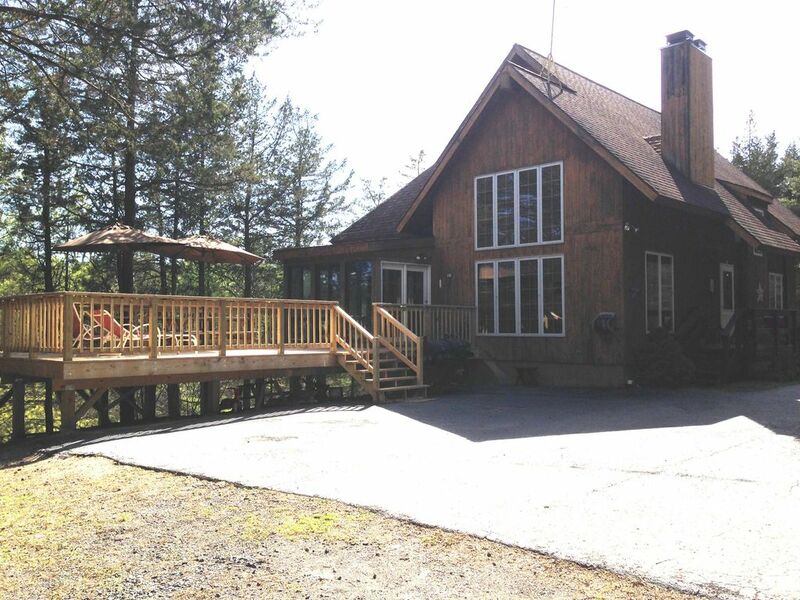 House is secluded by a forest of cedars giving you lots of privacy. Private dock and lakefront allow for swimming, kayaking, canoeing, fishing as well as lots of other fun water activities! House comes with a canoe, a kayak, outdoor hammocks, paddle board, and lounge chairs for the sun as well as several outdoor tables and enough outdoor seating for over 15 people. Brand new bbq is provided too. Huge deck outside of the home is perfect for al fresco dining among the trees and sunshine. The interior of the house has a large living room with a sectional sofa and a wood burning fireplace. dishwasher/ microwave/ coffee maker/ etc..
lots of board games and puzzles, poker table, dart board, and a pool table. Sleepy Hollow Extras: Sleepy Hollow is a private community so with the house rental you have access to it's two in-ground pools, Beach, clubhouse, tennis courts, basketball courts and many kids playgrounds as well - so much fun for the whole family to be had!! We are a family of four and our favorite place is Sleepy Hollow Lake. We found this community years ago when we rented a similar home for vacation here and we fell in love and bought our own. We can't wait to share it with you. It's a very special place all times of year! It's comfortable and you just feel like you are on vacation the second you walk through the doors! Waterfront so you have access to the lake and swimming. Large interior so the whole family can be entertained and doing their own thing! We had a small family reunion at this lake property. It was perfect. Simple, but spacious, well stocked with games, books, kitchen supplies, laundry, kayak and canoe, fire pit. We had small children who loved jumping off of the dock and swimming right there at the property. It was also nice to have the beach and pools in the development to use. We made s'mores in the fire pit and relaxed in the hammock. Welcome to Sleepy Hollow Lake, ''The Best Kept Secret In NY,'' nestled between the majestic Catskill Mt. Region & the Historic Hudson River and only 2 1/2 hrs. from NYC!! Recreational and cultural opportunities abound - Boating, fishing, skiing, hiking, tennis, swimming, biking, and sight seeing are all within easy access. THIS AREA HAS IT ALL. Historical parks, River sites, bird sanctuaries, caves, water parks, wine vinyards, mountains, antiquing, restaurants, golf courses and more. Thirty miles to the north, New York State's capitol city, Albany, offers exciting dining, shopping, and theatre opportunities. Athens and Coxsackie offer Hudson riverfront access, parks and dining. The nearby town of Hudson offers antiques, dining, and amtrak train service. In the wintertime skiing at Hunter and Windham mountains is only 30 minutes away! Who could ask for anything more! !